JASPER, Tenn. — The Jasper mayor's spending limit without prior board approval is $10,000, and now newly elected Alderman Jason Turner is questioning the need for that amount. In his second meeting after being sworn in as an alderman, Turner said during the Jasper Board of Mayor and Aldermen's January meeting he wanted to look at changing the mayor's spending limit. "I'd like to move that [spending limit] down," Turner said. "I want full transparency with the board and everybody — the taxpayers." He said that he examined the city's purchases, and as an example, he pointed to a bucket truck bought without board approval. The truck was bought for less than the $10,000 limit originally, but Turner said eight checks eventually were written for it that brought the total amount spent to $20,682. "I just think we need to drop that spending limit down, so maybe we [the board] can all make a decision on that to look at things like cost savings and things like that," he said. Mayor Paul Evans said he bought the truck for $7,500, but it had engine problems. Evans approved another $3,000 without the board's consent to have a new engine installed to get the vehicle in service. "I think that was the proper thing to do," he said. "I did what I thought was a good thing to do. I thought it was good for the town." The total for that truck was less than the $20,682 that Turner mentioned, Evans said, because some of that money was for work on other city vehicles. Turner proposed setting the mayor's spending limit at $1,500. "I'm not attacking you," Turner told Evans. "Believe me. I'm not." City Attorney Mark Raines said state law sets the minimum limit at $2,500, and the upper limit is $10,000. Before the conversation moved forward, he cautioned the board. "That's probably not something that's appropriate to bring up in general business," Raines said. "I think it ought to be its own separate agenda item." Meeting agendas have to be made so that "a reasonable person can understand what it is that [the board] is going to be talking about," he said. The board voted unanimously to put the issue on the agenda for its next regular meeting on Feb. 11 at 6 p.m. CDT. 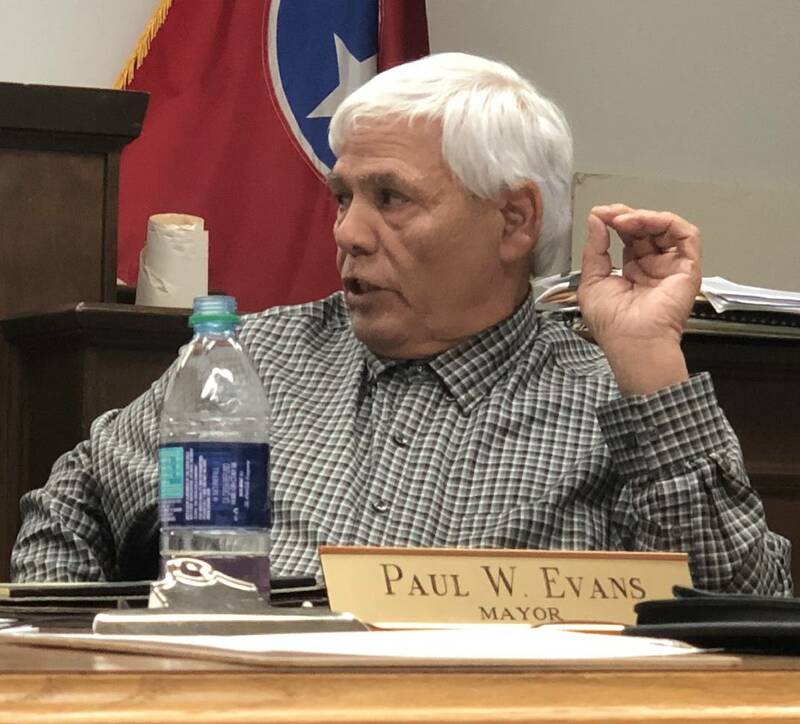 Evans tried to read a prepared statement on the matter twice, but both times Raines interrupted him and said the discussion should be done during a specific agenda item on next month's meeting. "I haven't done anything illegal, and I haven't done anything unethical," Evans said. "We have an audit, that's every year, and the auditors have not written me up for one thing of doing anything that's illegal and going beyond the mayor's means." Then Evans turned and spoke directly to Turner and Alderman Josh Jennings. "I challenge either one of you to go and dig and see what you can find on me because you're not going to find it," he said, getting somewhat emotional. "Call my auditor. Call [the Municipal Technical Assistance Service], or Josh, call your lawyer." Ryan Lewis is based in Marion County. Contact him at ryanlewis34@gmail.com.